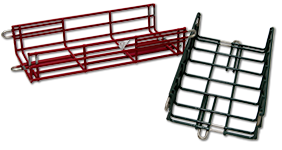 To help determine the correct cable tray size, view the following charts for weight loads. 2″ 0.93 lbs. 1.20 lbs. 2.76 lbs. 4.30 lbs. 5.34 lbs. 4″ 0.98 lbs. 1.29 lbs. 2.93 lbs. 4.56 lbs. 5.66 lbs. 6″ 1.39 lbs. 1.80 lbs. 4.06 lbs. 6.31 lbs. 7.83 lbs. 8″ 1.55 lbs. 2.05 lbs. 4.54 lbs. 7.00 lbs. 8.76 lbs. 12″ 1.67 lbs. 2.19 lbs. 4.90 lbs. 7.60 lbs. 9.41 lbs. 8″ 1.29 lbs. 2.19 lbs. 4.90 lbs. 7.60 lbs. 9.41 lbs. 12″ 1.41 lbs. 2.31 lbs. 5.26 lbs. 8.13 lbs. 10.07 lbs.